let's see if I can get people more involved in this blog. I will give a Maya Road Chipboard Album to the person who leaves the most comments in the course of two weeks, posts this blog on the side of her blog, becomes a follower and invites people to view this blog. Make sure you leave a comment letting me know that you are participating! I will make the anouncement after the two weeks starting Wed. June 1. Good Luck! Ahh how time flies! I rember taking the photo in this layout one winter day in our last house...The kids were having a blast baking cupcakes for their school...what I love about this layout is the perfect combination of flowers, papers and embelishments. This was also a class at Simply Scrapbook in Bakersfield, CA. 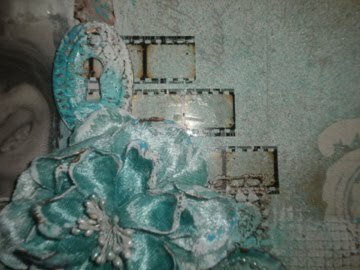 For this layout I used Glitz Glam Paper and stickers that go perfectly with Prima bling and flowers. On another note...let's see if I can get people more involved in this blog. I will give a Maya Road Chipboard Album to the person who leaves the most comments in the course of two weeks, posts this blog on the side of her blog, becomes a follower and invites people to view this blog. Make sure you leave a comment letting me know that you are participating! 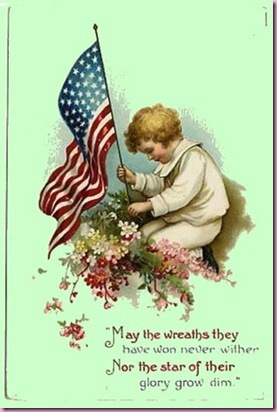 Many thanks to their families as I know how hard it is to have a loved one risk their lives for our freedom. A special thanks to the Navarro Family for allowing their youngest child Nicholas Navarro to protect us. God Bless our troops! Morning! so I had decided to create a class on Ustream but I never had the time to do so until today. 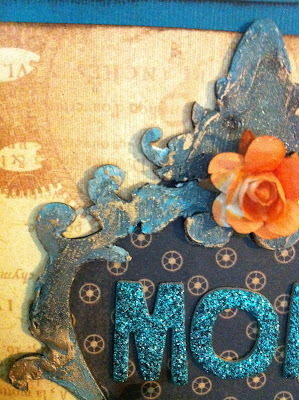 Here is a quick tutorial on how to create beautiful mix media chipboard shapes. Feel free to invite your friends to watch the short video as well, sorry for my kids yelling in the background, lol. Come back and view more videos soon and thanks for watching. Hello ladies and gentleman, did you notice that blogger was acting up last week? it was extremely crazy trying to post! Good thing everything is back to normal in the blogging world. lately I have been experimenting with Mix Media and I got to tell you that it is so much fun, I cannot believe how beautiful things turn out! A simple chipboard piece gets extra special treatment on this project. I will be sharing a tutorial later, so come back and check it out. Here is what I created for a co worker, she wanted a special gift for her mother and a special gift she got. 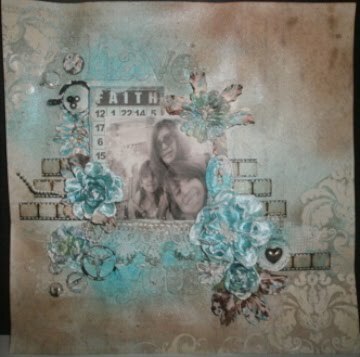 Using Graphic 45 papers, Tim Holtz dies, Prima flowers, Dusty Attic chipboard (available for sale at my kit blog), Tattered Angels, Rub and Buff and Acrylics I created this Mix Media Album. 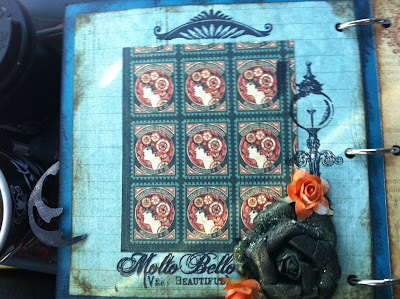 The cover features Dusty Attic chipboard (available at my kit club store), Prima flower, Tim Holtz grundge swirl and Graphic 45 paper. A closer look at the amazing texture you can create by using molding paste, acrylic paint, Tattered Angels Mist and Rub and Buff, love it! The inside pages are simple yet elegant. The twill tape also got a make over after I stamped it and Glimmer mist it. 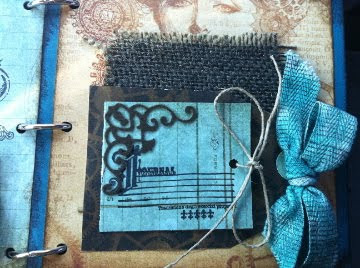 Come back and let me show you how to create this beautiful mini album as I will have a special class coming up! Watch tutorial on the last post!!!! 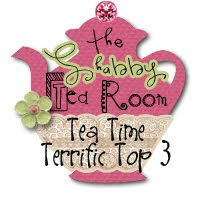 Hello readers, How was your mother's day? mine was excellent...time well spent with my little family. I received beautiful tokens of appreciation as well as lots of hugs and kisses from the little ones. 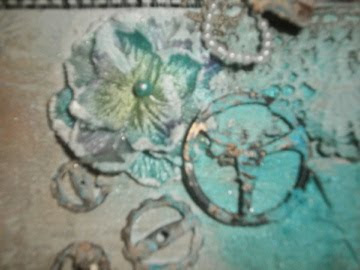 Moving on to more exciting things...I will be sharing a layout that I made using Mix Media. 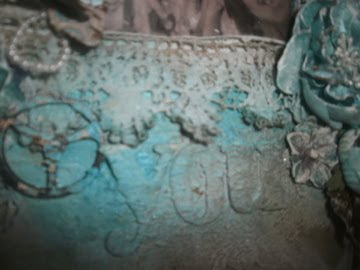 For this layout I used amazing Pink Paislee House of Three papers, Tim Holtz metals and film strips, 7gypsies clock pieces, Prima and Bazzil flowers, Prima Chipboard, Tattered Angels glimmer mist in Patina, Turquoise and Sand, Distressing Inks, Molding Paste, Magic Mesh for texture, lace, bottle cap, metal heart, pearls, etc. 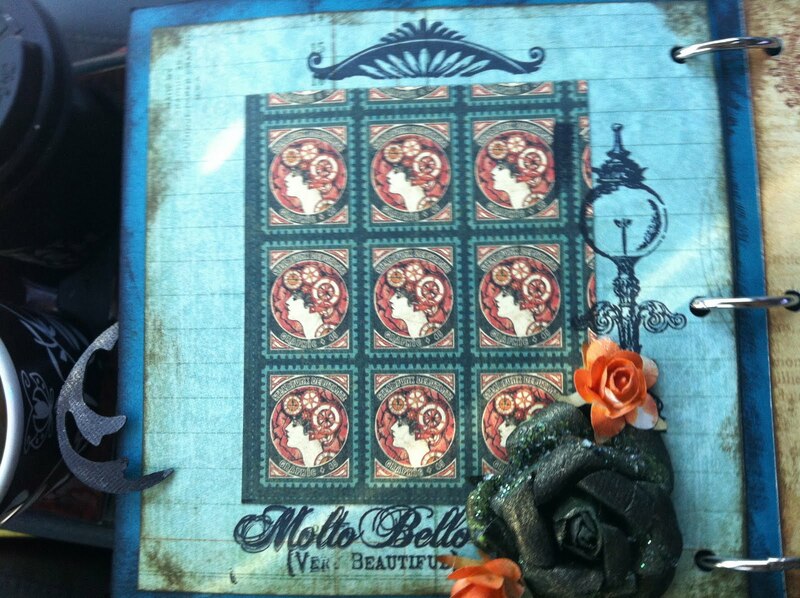 I began by inking the outside of my paper with Tim Holtz distressing ink I used antiqued linen. 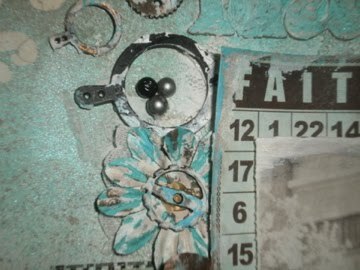 After that was dry I glimmer misted with Patina and Sand. Wait for the inks to dry before moving to another color. Once the glimmer mist dries you can apply molding paste but before it is completely dry create some more texture by using magic mesh and pressing it into the molding paste. Make sure you remove the mesh, then glimmer mist it or apply rub and buff. 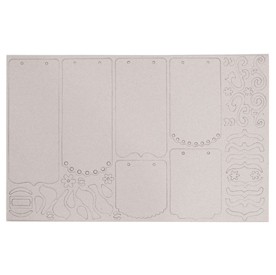 Feel free to add flowers, laces and metal pieces to your project. After they are secured apply more molding paste and glimmer mist. The above close up shows how I created layers. 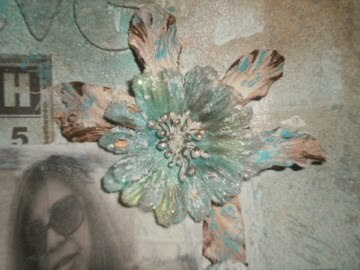 Using lace and molding paste as my base I simply folded a paper flower and applied some molding paste. After that's all dry apply acrylic paint, rub and buff and the film strips. Georgeous Prima flowers got a little touch up as well, I just added a little Tim Holtz distressing paints and rub and buff. Can you see the texture created by the magic mesh and the molding paste? that's my favorite part, soft and delicate yet it adds an interesting touch. Just another close up of more layers. For my tittles after the base was prepared with molding paste, lace and glimmer misted, I adhered the chipboard, more molding paste and more glimmer mist. 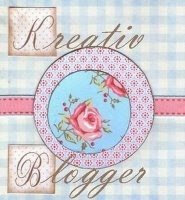 Hi ladies, it seems like I am always posting quick posts on my blog but that's because I am always on the go. My day usually starts early and finishes late. I wear many hats during work hours and after work too. I wish I had more time to focus on the things I love the most...Anyhow I created this mini sometime ago and I'm just now posting. 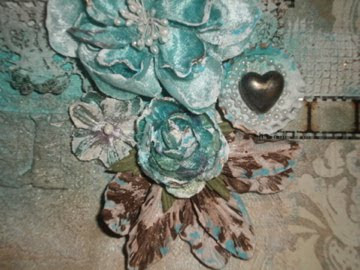 I used the Steampunk Debutante Graphic 45 line, lots of layers were added for texture, I also used 7 Gypsies rub ons on Prima flowers and metalic markers. 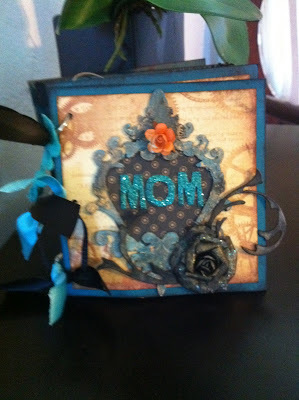 As you can see on this picture I used Tim Holtz hindges and covered it with patina...don't you love the look? I know I do! For the cover I used plain Bazzil black cardstock and stamped it with Prima Stamps then embossed it with gold embossing powder, I also added some fuzzy cuts and applied stickles. 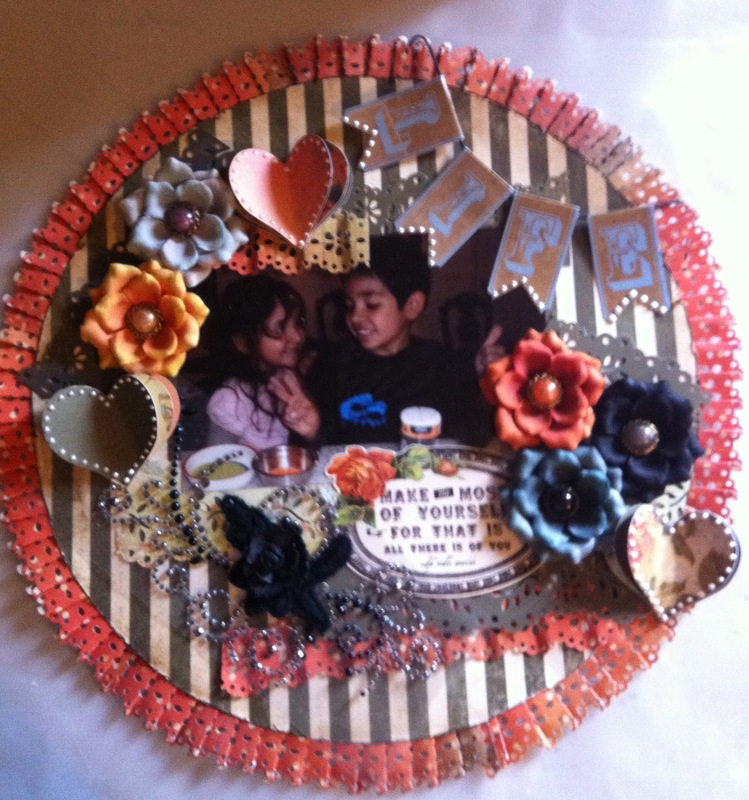 This is a more simple page; however, I did use Dusty Attic chipboard (which I will start carring on my kit club blog...just click on the button above), layers of chipboard, cut outs, metal embellishments and rub ons adorn this beautiful page. Again lots of paper layers and distressing on this mini. All the images, projects and work are property of Leslie Guerrero and or Divine Design Kits. Please do not reproduce any of the work without written notice. Todas las imagenes, projectos y trabajos son propiedad de Leslie Guerrero y o Divine Design Kits. Por favor no reproduscas ningun trabajo sin la aprovacion por escrito. Montly Challenges check us out!